Do you wish to freeze memorable moments of your life? 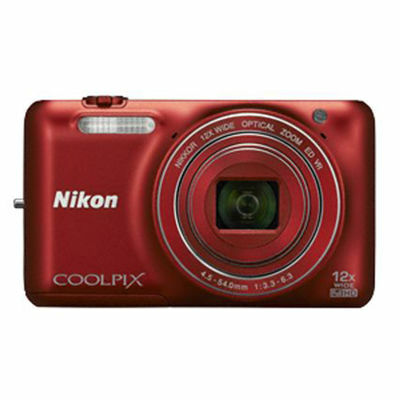 You can do so now with the Nikon Coolpix S6600 Point and Shoot Camera (Black). It has an enticing 16 megapixel resolution with 12x optical zoom and 4x digital zoom for superior quality images. The 12X Nikkor zoom lens enables optical zooming up to 300mm without pixelating the image whether it is a panorama or close-up shot. You can share your happiness with friends and family with the uniquely designed Wi-Fi technology that enables you to easily transfer the photos from the camera to your smart phone and on social networking sites as well. The Nikon Coolpix has a wide 2.7-inch twisting vari-angle LCD screen that allows you to capture clear portraits, low angled shots and large landscapes. The large LCD screen allows you to view the camera settings without disturbing your view. Capturing images and recording videos with a small gesture is now made possible with the gesture control option. The compact Nikon Coolpix is features auto mode, continuous shooting mode, scene selection mode, smart portrait and special effect mode for taking varied pictures without having to edit it later. The S6600 has an incredible image size of 4608 x 3456 pixels and movie size of 1920 x 1080 pixels. It also has an image sensor that detects images in low-light settings. This black Nikon digital camera has vibration and motion blur reduction function along with an auto-focus mode that differs based on the mode opted. The self-timer can be selected from 10s and 2s. This Nikon point and shoot camera has a 4GB memory storage capacity with hi-speed USB interface. The package contains main unit, a camera strap, 4GB memory card, rechargeable lithium-ion battery, charging AC adapter, USB cable, ViewNX 2 CD and a reference Manual CD. Go on and capture all the beautiful moments with the Nikon Coolpix S6600. Do you wish to freeze memorable moments of your life? You can do so now with the Nikon Coolpix S6600 Point and Shoot Camera (Black). It has an enticing 16 megapixel resolution with 12x optical zoom and 4x digital zoom for superior quality images. The 12X Nikkor zoom lens enables optical zooming up to 300mm without pixelating the image whether it is a panorama or close-up shot. You can share your happiness with friends and family with the uniquely designed Wi-Fi technology that enables you to easily transfer the photos from the camera to your smart phone and on social networking sites as well. The Nikon Coolpix has a wide 2.7-inch twisting vari-angle LCD screen that allows you to capture clear portraits, low angled shots and large landscapes. The large LCD screen allows you to view the camera settings without disturbing your view. Capturing images and recording videos with a small gesture is now made possible with the gesture control option. The compact Nikon Coolpix is features auto mode, continuous shooting mode, scene selection mode, smart portrait and special effect mode for taking varied pictures without having to edit it later. The S6600 has an incredible image size of 4608 x 3456 pixels and movie size of 1920 x 1080 pixels. It also has an image sensor that detects images in low-light settings. This black Nikon digital camera has vibration and motion blur reduction function along with an auto-focus mode that differs based on the mode opted. The self-timer can be selected from 10s and 2s. This Nikon point and shoot camera has a 4GB memory storage capacity with hi-speed USB interface. The package contains main unit, a camera strap, 4GB memory card, rechargeable lithium-ion battery, charging AC adapter, USB cable, ViewNX 2 CD and a reference Manual CD. Go on and capture all the beautiful moments with the Nikon Coolpix S6600.